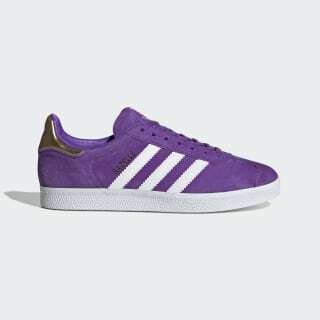 Colour: Collegiate Purple / Ftwr White / Gold Met. Trainers that celebrate London's newest Underground line. The streamlined simplicity of the Gazelle shoe has lasted for three decades and counting. This pair is a collaboration between adidas Originals and Transport for London to celebrate the opening of the Elizabeth Line, London's newest Underground line. The left shoe has a Trefoil, and the right shoe shows off a 3D Elizabeth Line logo. A gold metallic heel and gold details on the tongue and lace tips add a glam touch. Product colour: Collegiate Purple / Ftwr White / Gold Met.